Disruptive or not: new technologies have great impact on society and education. 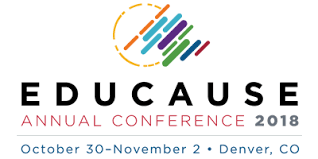 At the Educause Conference in Denver, 30 October – 2 November 2018, higher education met with technology industry. Maastricht University (UM) Robert Buzink (Student Service Centre) and Frederike Vernimmen (University Library), visited this conference. In this blog, they share their lessons learned for UM. The study trip to the Educause Conference was organised by SURF for a group of Dutch higher education institutions. Institutions are called by the Silicon Valley Institute of the Future to pace up and formulate their strategy for the coming 5 to 10 years. So UM is in time with current discussions on the IT strategy. Furthermore, the urgency of breakthrough communication and collaboration across individuals, teams, and organisations becomes more and more evident in a highly innovative context. The cooperation of teachers, instructional designers and IT specialists is key for success! A practice which is more and more common at our university in cooperation between EDLAB, service centres – the Library, SSC, ICTS – and faculties. Artificial Intelligence (AI) and Machine Learning were a frequent topic. Industrial partners seemed to be further ahead than institutions. AI makes it possible to automate very specific tasks, like generating textbooks (e.g. with Bbookx) and quizzes (e.g. with Inquizitive), but also to act as a personal tutor in content curated textbooks (IBM Watson/Pearson’s Revel-tutor). But we have to become skilled in avoiding biases, as stated by Teddy Benson, lead in data integration and data analysis at various industries, in knowing the environment and the (origin of) data and by continuously verifying model training and logics. Techniques like Augmented, Mixed and Virtual Reality can create learning spaces where students can practice these and other professional skills in a safe environment. James Phelps, director of Enterprise Architecture & Strategy at the University of Washington sketched scenarios and pathways for the future-ready Workforce. Jobs of all kinds will radically change during the next decade. Both staff and students in higher education will need new digital skills for success in their jobs and their education. Lifelong learners become the majority of enrollment. Alexis Ohanian, co-founder of trending news-site Reddit, showed that although routine work is decreasing, creative and non-routine work is actually increasing by AI and robots. Everyone should learn some foundational programming in order to cope with technology based society in the 21st Century. Mike Caulfield, director blended and networked learning of Washington State University Vancouver, showed how a ‘digital first’ approach in information literacy for first year writing and academic skills classes at 12 institutions resulted in better critical reading and fact checking of information coming from the internet. How can technology enhance active learning? The pre-conference visit to Colorado State University Campus showed how the UNIZIN consortium of 11 universities creates an ecosystem, where a shared learning environment, open and licensed content, data and analytics improve learner success. Next step would be free content via several platforms like Open Stax or OER Commons. The University of Vermont’s College of Medicine announced in 2016 that their curriculum would remove all lectures and move exclusively to active learning ultimately in 2019. They shifted to PBL and case based learning with blended e-learning support and technology rich maker spaces at the Teaching Academy and the Library, with frequent assessments and fully integrated in the Learning Management System. This could be interesting for the UM in light of the outcome of the Edview project that current assessment practices at UM might not fit PBL. The University of Florida case illustrated the collaborative approach of instructional designers and study advisors to implement ‘flipped advising courses’, supplemented with peer feedback and integrated in the Learning Management System, which helps students to become more confident. An important topic also in relation to the Maastricht University Quality Agreements for more and better student guidance. Learning Analytics is mainstream in the US, where benchmarking is part of people’s DNA. A National Landscape Analysis by NASPA provides an overview of the use of data and analytics for student success. Focus of LA seems to shift from management info afterwards to up front information to enhance learning. Jim Folkestad of the Colorado State University Centre for Teaching and Learning admits that the analyzing of group processes in small-scale settings like PBL needs deeper insights in meaningful data for (peer) feedback and self-directed learning. Another hot topic is micro credentialing with digital certificates or badges for short-term curricular or extra-curricular courses. Badges seem to move towards competency-based models, especially connected to labour market requirements. Well-known platforms are Badgr and the Achievement-tool in Blackboard. In the technical field, the IMS Learning Consortium showed the advantages of Learning Tools Interoperability (LTI) bringing solutions for connecting the LMS to different tools and applications by intuitive deep links. Could be of great help for Maastricht University moving to a next Generation Learning Management System!